Butterjoint, Legume’s full-service bar, sits unobtrusively on North Craig Street in Oakland. It has mauve walls and a dimly-lit interior. With only a handful of tables in addition to the bar, it’s cozy but restrictive — a place where long waits are the norm. I had visited the gastropub four times before, so I knew getting a table would be a trying task. My friend and I arrived promptly at 6 p.m. last Friday in an attempt to leapfrog the wait for Butterjoint’s high-end bar food, which is similar to Downtown’s Meat & Potatoes. No such luck. In past visits and past experiences waiting, I had indulged in a variety of sweet cocktails — priced at around $10 — and expected more excellent drinks to go with our small meal. As we waited for a table, we looked at the cocktail list with those memories in mind. My friend was unsure what to order. Butterjoint’s drink list can be intimidating since, unlike Peter’s Pub or Garage Door Saloon, you won’t find Jägerbombs or syrupy breakfast shots. Lost amidst the vermouths and Peychaud’s bitters, my friend asked the waiter what he recommended. He pointed to the Elder Fashioned, waxing poetic about the mix of Angostura bitters, the floral notes of St. Germain (an elderflower liqueur) and “junipery” Beefeater gin. My friend’s eyes glazed over. I told her I’ve had it before, and that it’s pretty light and sweet. I ordered a Negroni (gin, vermouth and Campari, an orange liqueur) for the first time, and we quickly received our sunset-colored drinks. My friend took a sip and her nose wrinkled in distaste. I sipped my own drink, and the astringent and bitter orange taste was overwhelming. “Tastes a bit like … medicine,” I said, a thick coat of alcohol wrapping around my tongue. My friend agreed, holding her drink at arm’s length in disdain. We swapped, and I tried hers. It was herby, the gin masking the taste of the floral St. Germain and the bitters, which were lost in the mix. Maybe my friend would have been better off at the mercy of the bartender, and perhaps I would have, too. Actually, scratch that. This bartender would have had no mercy on us. He had a heavy hand with the base spirits, and, if given free rein, we might have wound up comatose on the floor. My experiences at Butterjoint in the past were quite different. The drinks were fabulous — not the punch in the face that I experienced with the Negroni. On previous visits, I ordered the sweeter Beleriand (a cherry brine cocktail), an apple shrub and a carafe of white wine. As we tortured ourselves with small sips, we returned our attention again to Butterjoint’s menu. We ordered pierogies with no sides, since the pierogies were $8 and the sides ranged from $2 to $11 extra. We sat sipping our drinks. My friend gave up on hers quite quickly, and I only continued because the small glass had cost me $10. 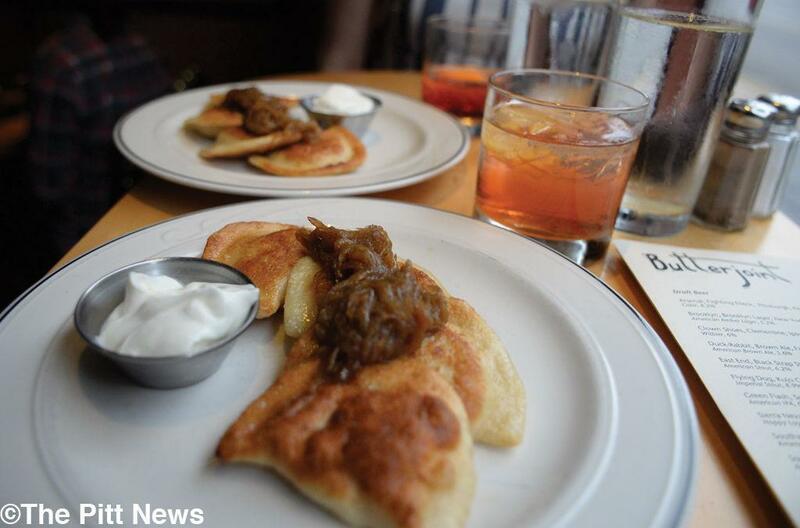 Our waiter flitted about, checking in on us occasionally, but our pierogies were still trapped in the kitchen. After 20 minutes, we finally saw two white plates heading toward us under the glint of the dim lights. Four small golden pierogies sat under a mound of caramelized onions. The pierogies tasted as stellar as they looked. Each bite puffed with potato and the tang of cheese. The onions were rich and luxuriously melded with the creamy potato filling. As we gorged, my friend commented on how these were some pretty fine $2 a pop pierogies. I put my fork down and realized that, yes, they were fine, but were they really worth $2 each? We finished quickly, trying to slow down and enjoy each bite, but we found it virtually impossible, considering our hunger. Still craving more food, we looked over the menu again. The burgers looked good, but the basic burger started at $12. Even adding American cheese was an extra dollar. Forget that. We scanned the dessert menu instead. I haven’t had a bad dessert from Butterjoint, so with high hopes, we ordered the buttermilk panna cotta with espresso-soaked figs and espresso meringue. The plate arrived, the delicate panna cotta jiggling slightly, a glistening orb of tangy buttermilk. It was topped with the figs, and chunks of cocoa-colored meringue rested like little icebergs. The first bite was extravagant, the rich figs and crisp espresso meringue providing an earthy contrast to the cream. Each following spoonful was perfection. My only complaint was that we got maybe five measly pieces of meringue — I wanted more. Our spoons scraped bottom, and I was tempted to throw manners to the wind and lick the espresso syrup off the plate. Butterjoint is capable of scrumptious moments like this, but they come with the occasional bitter sip. The food is good, albeit overpriced, and your drink satisfaction depends on the mercy of the bartender.